Why America’s gas stations are running out of time. They’ll soon be as quaint as a bookstore or soda fountain. Gas stations’ futures look bleak. 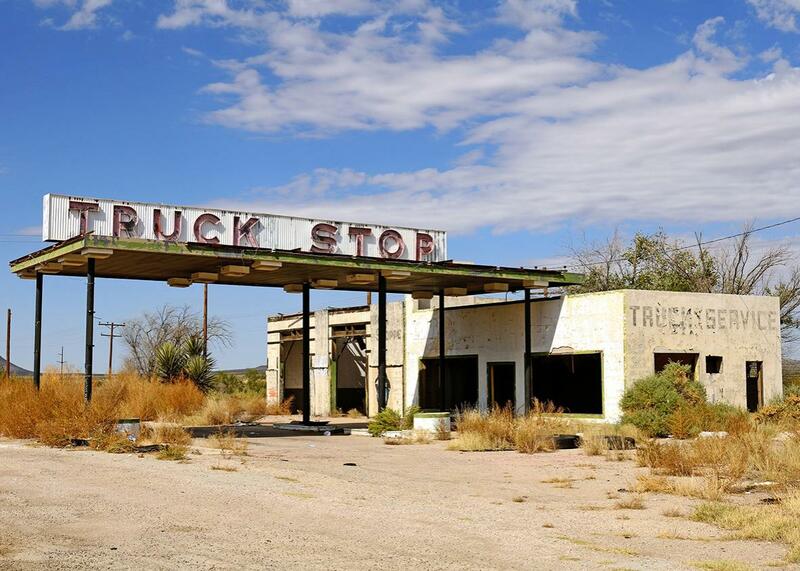 Above, an abandoned gas station near Sierra Blanca, Texas. Pity America’s gas station owners. They may not be with us for much longer. Yes, despite the recent spike in the price of oil, gas still remains historically cheap. And Americans are buying plenty of cars that consume lots of gas, and they are driving many more miles than they were a couple of years ago. But gas stations have been in decline for decades. Between 1994 and 2013, the number of retail fueling sites in the U.S. fell from 202,800 to 152,995—a 25 percent decline. In 2015, the number had slipped to about 150,000. (See page 31 of this report from the National Association of Convenience Stores.) And with several powerful megatrends arrayed against them, there are signs that their numbers could shrink significantly in coming years. Let’s start with gentrification. (And this is the good news.) In many urban areas, gas station owners are finding it simply doesn’t make economic sense to keep selling gasoline—for reasons having nothing to do with demand for their product. As America’s great cities revitalize and attract more wealth, land is becoming exceedingly expensive. In many cities, and especially in New York, a gas station falls far down on the list of the best things to do with a piece of land. Owners realize they can run their businesses at modest profits for years to come or sell out to developers for giant premiums. In Manhattan, where the best use for a gas station is a site for condominium or office development, the number of gas stations fell by a third between 2004 and 2014—to just 39. As the New York Times reports, “Today there is not a single operating gas station left on the city’s East Side from the southern tip of the island to 23rd St.” The conversion of gas stations into apartments and offices is also starting to happen in other land-constrained cities such as Boston; Washington; and especially San Francisco, where at least two-dozen gas stations have made way for other developments over the past six years. Several other trends are afoot that will lessen the underlying demand for gas stations’ core product. Gasoline, which was pretty much the only transportation fuel for vehicles until very recently, is slowly being displaced by a couple of sources, neither of which relies on gas stations to deliver them. First, there’s natural gas. Cheap and abundant thanks to fracking, compressed natural gas and liquefied natural gas are emerging as options—not so much for consumers and individual cars but for fleets. One of my favorite sites, NGT News, documents how operators of huge delivery fleets such as UPS or giant armadas of garbage trucks such as Waste Management are systematically switching their fleets to run on natural gas–based fuels instead of gasoline. NGT News is also filled with news of the new infrastructure springing up to service all these fleets. According to the Energy Department, there are 921 CNG fueling stations in the U.S. And there are hundreds more on the way. New chains of CNG stations are being built from scratch. Cities and municipalities are building their own stations to fuel fleets. The other force is electricity, of course. The penetration of electric cars in America’s fleet is still very low. But every month, several thousand new cars hit the roads—Teslas, mostly—that don’t use any gasoline at all and will never, ever, ever stop at gas stations (unless their drivers need to make a pit stop for a Fresca or beef jerky). Sales of all-electric cars are running at about 6,500 month, according to Hybrid Cars. But there are signs of greater electrification. About 6,000 plug-in hybrids, like the one I drive, are sold every month. And there are many, many more to come. Tesla has already taken reservations for more than 370,000 Model 3s. Off in the distance, the prospect of self-driving and autonomous cars also poses a threat. Driverless cars may take much longer than people think to develop into a real thing, because of issues surrounding licensing, insurance, liability, and infrastructure. But it’s not too far-fetched to imagine that a decade from now, people, rather than owning cars, might subscribe to some sort of mobility service that runs fleets of autonomous vehicles. Will those cars refuel at the local Sunoco? Or will they go back to base at night where their owners will gas them up? And if you want to really look to the future, look no further than Norway. The country—irony alert—has deployed some of the wealth from its vast North Sea oil resource into generous incentives for electric cars, which now constitute about 20 percent of new cars sold there. Now come reports that several political parties may propose a law that would forbid the sales of cars that run on gasoline by 2025. Gas stations won’t greet all of these developments lying down, of course. Many of them occupy locations that will enable them to continue fulfilling their fueling function. The gas stations on Connecticut’s Merritt Parkway, for example, have already been fitted out with Tesla charging stations. Some convenience stores are adding CNG pumps to their array of gasoline pumps. We’ll likely see much more of this. But these are expensive efforts for low-margin businesses to undertake. Future government action—the prospect of the Environmental Protection Agency enforcing the new high-mileage limits or offering new incentives for alternative fuel vehicles—will likely help push greater consolidation and contraction in the industry. Ten years from now, gas stations may be pushed out of central cities and concentrated near highway off-ramps. Players such as Walmart and Costco, which already sell gas on very low margins, will gain market share. Like those other fixtures of our 20th-century downtowns and main streets—the neighborhood soda fountain, bookstore, and sporting-goods store—the local gas station may be fading into memory in the 21st century.